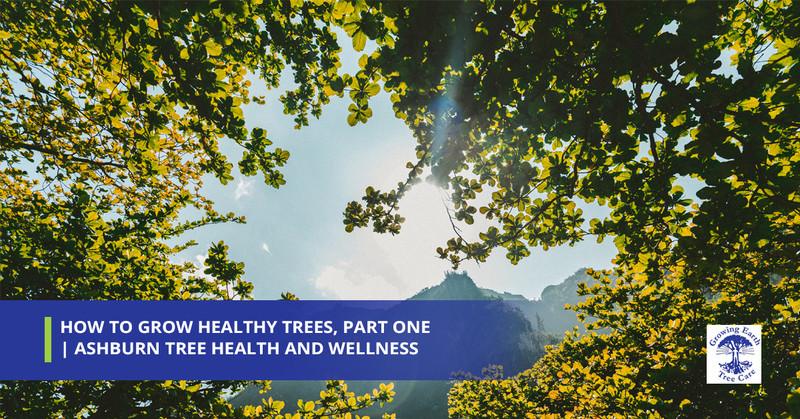 Taking a step back from more specific articles of late which have varied between getting ready for summer, emergency tree removal, highlighting our range of tree care services, and seemingly everything in between, we are going to take a look at some basic tips for growing healthy trees. Although we are tree care experts, we much prefer to see happy and healthy yards full of vibrant trees. We at Growing Earth Tree Care offer a variety of tree care services, from tree removal, tree pruning, tree pest control, to soil and root consultation. We have a heart for helping our community in whatever we way can, and the best way we can is to educate in order to prevent bad tree care from occurring. And although we have been called “tree doctors” before, any doctor worth their salt will tell you that an ounce of prevention is worth a pound of cure. With that in mind, read on if you are interested in keeping your yard, orchard, or perhaps forest healthy. That way, you won’t need to call us every summer for tree pruning, or tree and stump removal. Although slightly vague to begin with, all you have to do is select which kind of tree you are interested in, and then whittle down your options from there. Other aspects to consider when selecting your kind of tree include location. Planting trees in the wrong area, despite the fact that they are functional within a given environment, can still have adverse effects. One such “wrong area” is under utility lines, if your selected tree will grow tall enough to be affected by the lines. This will likely cause your trees to become damaged over time. An example of correct placement would be planting shorter, flowering trees under utility lines, so you don’t wake up 15 years later with an expensive hassle on your hands. Make sure you have a purpose for your tree in mind. You could protect the north side of your home from harsh winter winds, for instance. Failure to account for future root growth given your select kind of tree can lead to more trouble down the road. Of course, if you have a huge yard or orchard that you are trying to develop, this likely won’t be as much of an issue. But everyone must consider how big their trees will get, both above and underground. If you don’t have a huge space but are looking to still fill out your backyard, consider dwarf trees, like a citrus tree, which are lovely to look at and naturally take up less space than an evergreen or most nut trees. Take care with your new plantings. Despite what you may have read or heard, you do not want to plant a tree with a rope or wire basket that will constrict the roots to any degree. This “girdling” of the roots will, you guessed it, negatively impact the health and wellness of the tree down the road. Additionally, take care of your tree by not filling too much soil over a freshly planted tree. This will damage the tree and even kill some species. Because each tree has a different level of “too much” consult your local Ashburn tree care specialists at Growing Earth Tree Care for consultative information on your specific situation. Thus concludes part one in our two part series on how to grow healthy trees. We hope that you have enjoyed this initial post which should give you a good place to start. In our next article, look out for the next steps in the process of planting and maintaining healthy trees. We will look into tree pruning techniques, when to call in an expert, and much more. If, however, in the meantime you are in need of a certified arborist for tree removal, tree disease treatment, or even pest control services, remember that your local tree service company is only a phone call away. We are proud to be Northern Virginia’s top rated local tree care service provider. Our service area includes McLean, Reston, Vienna, Springfield, Arlington, Falls Church, Loudoun, Fairfax, Alexandria, and pretty much everywhere in between. We are one of the few local tree service companies that have been accredited by the Tree Care Industry Association, and, for good measure, we are also a member of the Washington Area Better Business Bureau. Founded in 1976, we know this area well and we care about the community and environment of Northern Virginia and the surrounding region. Our clients include anyone from property managers, homeowners, HOAs, to commercial property owners. We have even written a book called “Trees, Landscapes, and You”, just in case you had any doubts about who to call for tree care advice! Contact us today for a free estimate from the tree care experts, today.